This page will help you get ready to start providing RMR measurements and help you market your new service. Using The BodyGem Analyzer Software Questions And Answers FAQ. Understanding the numbers on the Analyzer software and printout. RMR accounts for 70-75% of the calories a person burns each day. Their Daily Calorie Expenditure is RMR + Lifestyle. This how many calories they will burn without exercise. Their Daily Calorie Budget is RMR + Lifestyle – Weight Goal. So the difference is based on their weight loss goal. They can eat their planned Daily Calorie Budget and let those exercise calories that they burn help them lose weight more quickly. Or they can add 200 calories to their Daily Calorie Budget to maintain the 500 calorie imbalance. The Analyzer software estimates the clients body fat percentage, and it’s +/- 2% of DEXA on clients that have a BMI of 28 and higher. 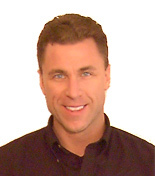 The next release of Analyzer software will allow you to insert your measured body fat percent. The serial cable mentioned in the training video is not included in the System Kits, but is available for $50. Connecting the BodyGem or MedGem to a computer during a test only gives you a few benefits; it allows you to see their tidal flow as their breathing settles in during the test, and it automatically enters the RMR number in the Analyzer software. The drawback is that you have to test your client near a computer, versus being able to test anywhere. And some computer USB ports don’t properly sense the device. 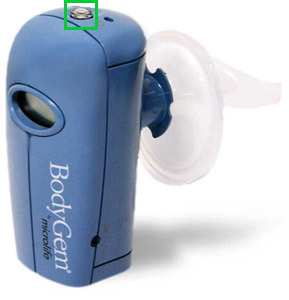 To initialize the BodyGem measurement, simply press the button on the top of the device. It will do a self-test, and then beep and the light will turn green, when it is ready to start the measurement. 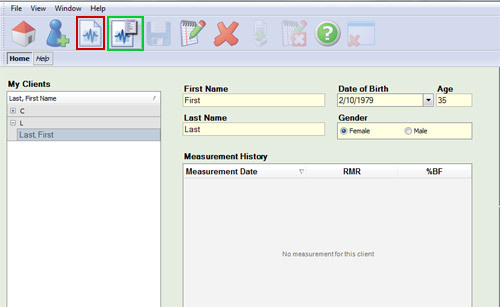 Then in the BodyGem Analyzer software, click on the Enter Measurement for Client box (green box) and simply enter the RMR number into the Analyzer software. Enter your contact information, including the serial# of your device; and you will be given access to the download file. You will still need to enter your Registration Code from the CD case. If you don’t have one, contact us. To access the serial number of your device follow these instructions. The white label with the model number and serial number is located behind the flow tube. 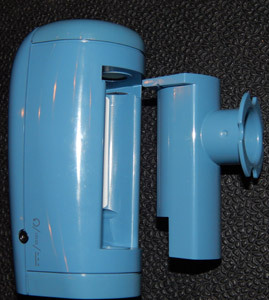 The mouthpiece filters connect to the flow tube, which slides out of the device. Hold the device in one hand, and pull on the neck of the flow tube with the other while gently rocking it back and forth, and it will slide out. The white label is on the inside of the indirect calorimeter. Do not touch any of the sensors on the top and bottom of the device. Then slide the flow tube back in, making sure the top and bottom of the flow tube are completely flush with the BodyGem or MedGem device. When you per-use device has only 10 measurements left, it will warn you, so that you can get a Reorder Kit before you run out of measurements. The Start Button on top of the device will flash yellow and green, and the C-## will appear on the LCD panel, showing you how many measurements you have left. To bypass the warning, press the Start Button twice to start the initialization process. The Start Button will turn solid green when it is ready. The marketing poster and trifold brochures that came with your system kit will help your clients understand the need for RMR testing. The posters look great with a black frame from your local arts supply store. The tri-fold brochures can be placed in a vertical brochure holder on your reception desk. You can order additional posters and tri-fold brochures. Posters are $5. Tri-fold brochures are $25 for 50. If your facility has glass at the entrance, you can have “Get Your Metabolism Tested” lettering painted on the glass to attract the attention of walk-by traffic. People will pay just to know what their metabolic rate is, as many people believe that they have a ‘slow metabolism“. To help you market your BodyGem and MedGem metabolic rate testing services, I’ve provided some RMR test marketing materials. You can update these Word documents with your contact information.